LEXINGTON, KY — Sometime during one of his daily commutes between his home in Frankfort and his job in Lexington, where he teaches journalism at the University of Kentucky, Al Cross had an idea. Between the two cities lies the aptly named Midway, a town with a census population of 1,647 that, at the time, was covered solely by the Woodford Sun, a county-wide weekly with a minimal online presence. Thinking the town might serve as a nice proving ground for his journalism students, Cross launched the Midway Messenger. Cross modeled the online-only news source after The Carrboro Commons, a project run by the University of North Carolina. 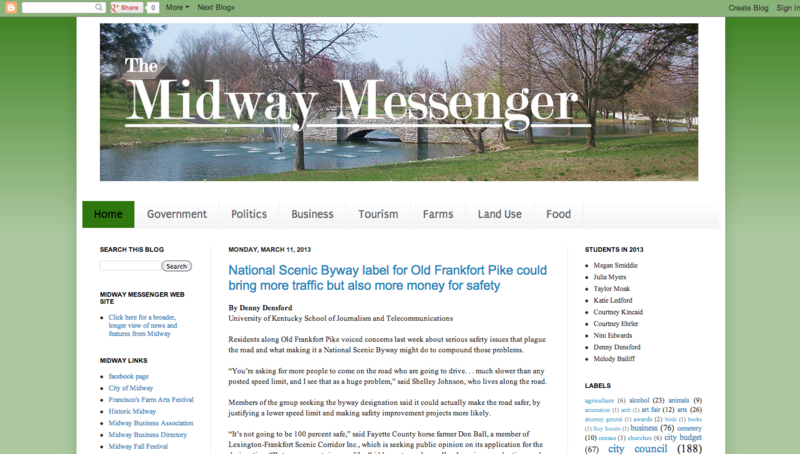 The Midway Messenger’s core goal is to give students first-hand experience producing online and community journalism, while amplifying coverage for the city of Midway. Powered by Kentucky undergraduate journalism students, the site goes through three different phases each year. In the fall semester, Cross teaches a community journalism course, and makes writing for the Messenger an option for his students. In the spring, he teaches online journalism, and this course is centered entirely on working for the Messenger. During the summer break, Cross runs the site himself as a one-man show, visiting Midway and writing on a regular basis in order to reassure the community that the site remains active. Though Cross and his students do not have a physical bureau in Midway, they visit the town frequently to speak with sources, and also follow up on stories that appear in the Woodford Sun. “You can’t depend on us to cover everything in Midway, but you can certainly look to us for a depth of coverage of some things you won’t find anywhere else,” Cross says. For example, Cross mentions the Messenger’s May 2012 story on the resignation of Midway College’s president. After reading a favorable 2,000-word, one-source story on the resignation in the Woodford Sun, Cross and his students made inquiries, eventually uncovering that the resignation was a direct result of the president’s mismanagement of an expansion of the school’s pharmacy program. “I never really expected to do an investigative story like this, but it was essentially laid out in front of us, and the local newspaper had failed to tell people the truth,” Cross says. Looking ahead, Cross is considering numerous plans to ensure the site’s longevity. The Messenger will remain a student-powered publication for the foreseeable future, but Cross would like to get more members of the Midway community involved in the site, possibly by creating a board of directors. A formal collaboration with the Woodford Sun, with the Messenger helping to expand the paper’s online presence, is also a possibility. “That’s what news media ought to do,” Cross says. Meredith Qualls is a CJR Guide to Online News Startups contributor.